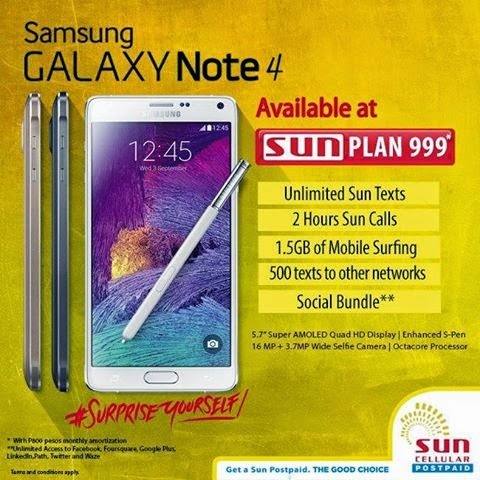 Get the latest Samsung Galaxy Note 4 when you apply for a Postpaid plan 999 at Sun Cellular. It has 5.7 inches Super AMOLED screen, 16 megapixels camera and runs on Android Kitkat. The plan includes Social bundle where you can get unlimited FB, Twitter, Google+, Linkedin, Path Foursquare and Waze. Aside from it also includes the Sun call, unli text and mobile internet surfing. Free Social bundles *FB, Twitter, etc. Note: Basically your monthly bill will be 1799 (Plan 999 + 800 Note 4 unit monthly cash out). This plan is already affordable compared to other telco. Maybe some of you where disappointed with the mobile surfing bundle. It has a limited 1.5GB that includes free access to selected Social apps. If you’re a hardcode video streamer and downloader, the allocated data is surely not enough for you. You should use the data wisely when you subscribe to this plan to avoid excess charges. This plan may change without notice. You may visit Sun Cellular or go to your nearest Sun Shop to inquire for updates. For plan requirement check "How To Apply Sun Plan" for your reference.